Picnic’s all planned and packed and then it pours down with rain. No, not the intro to an Alanis Morissette song, but just the kind of thing to expect with our infamously unpredictable weather. Not to worry, you can do that picnic next weekend, instead. For now, however, you have 2 kids hungry for some entertainment and, worst of all, you’re locked inside with them. 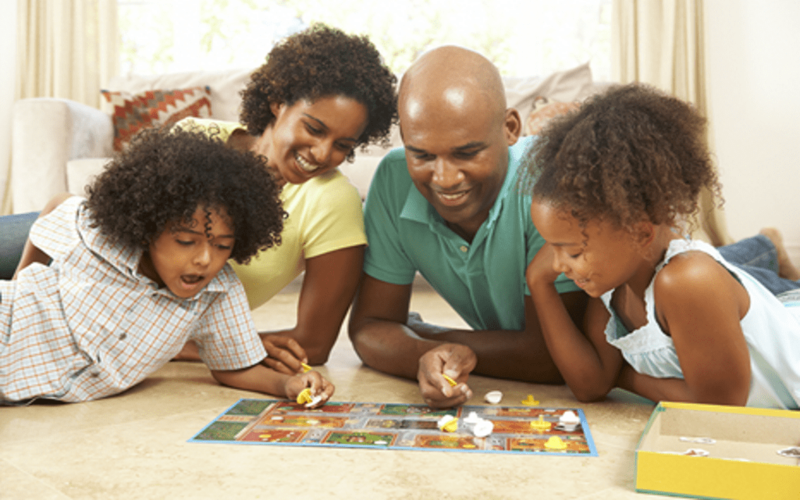 Rather than flicking on the TV or sending them upstairs to hit the video games, stick with the theme of the day (spending it together, interacting – y’know, doing family stuff) and set about having some fun together. Whatever Alanis Morissette may or may not think of the rain, for us it’s going to be an opportunity to play, laugh and be creative with the people we love most. Besides, if it doesn’t work out, the video games aren’t going anywhere. It’s a board game classic, up there with those board game hall of fame incumbents, Monopoly and Risk. Perhaps what it has over those legendary entries is the time factor. Whereas Monopoly, especially, can just go on and on, Cluedo is less of a commitment, and you can quite comfortably get two games in in a single sitting without it being too much. Also, Monopoly and Risk are well known for getting a little bit testy at times. They are highly competitive games, and only the most ruthless win out. Best stick, then, with altogether lighter material. Cluedo is an age-old family fave for good reason – and makes for a great way to pass a rainy day. Another board game that isn’t too heavy, long-lasting or downright nasty. Not that you’d think it from the subject matter. Despite the theme of global disease (four of them, to be precise) this isn’t so much a game of survival of the fittest, as one of cooperation and team problem solving. Together, you and the family can pit your wits against the challenges presented by aforementioned premise, which will have you constructing research centres with the aim of arriving at a cure before time runs out. The game is beautifully designed, and though it doesn’t currently have the status of other more established board games, it is set to become a classic. No board required, this is a fun parlour games that can be played pretty much anywhere, anytime, with any number of people. You can go down the old ‘animal, vegetable or mineral’ route, or jot down some famous celebs on name labels and stick them to each other’s foreheads. Another way to spice up a great game that can last as long as you want it to is to offer a little prize each time someone guesses their name or gets the answer within the 20 question limit. Some might call it a game of physical skill that puts to task your athletic abilities and suppleness, others might call it a silly, fun, but chiefly hilarious way to hang out with the people you love. Brilliant for family members of all ages, just make sure you have plenty of space, and that you have completed all the required limbering up and stretching beforehand. Want to add an extra twist? For those families out there who perhaps spend many of their days on yoga mats chanting various mystic incantations, you might feel confident enough to try ‘Messy Twister.’ Here, you add a dollop of shaving foam to the centre of each section of the Twister mat, thereby making it slippery and a whole lot more difficult. Like 20 Questions, pen partners is a minimalist entry to our best games, that requires nothing other than a pen or pencil and some paper, not to mention some impressive communication skills. Partners sit back-to-back, one with pen and paper (Partner A), the other (Partner B) ready with their finest abilities of verbal expression. Partner B will now describe to A how to draw a household object, but without at any time offering any indication of what that object is. How long will it take for B to recognise what they’re depicting? Place a time limit (5 minutes should do it) and great ready to have tons of fun checking out the results.